You are here: Home / Family & Traditions / Christmas / Was Darth at your family Christmas lunch? 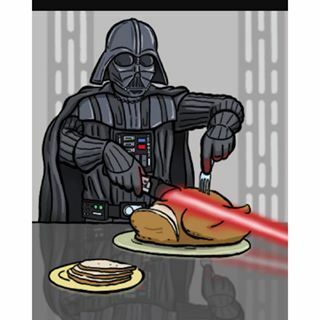 Many of us will have had at least one Darth Vader at the Christmas table this year. More grumpy than a Wookey with dandruff. Moaning about the weather, the noise, the fuss and bother. A traditional dark presence who doesn’t play games or truly get into the spirit of things. It could have been Uncle Bert or even Aunty Mildred in costume. They were there at your starry eat fest. Am I right? On reflection what could you have done better? How can you be ready for the next invasion at the table? You are the hostess who had done everything in your power to make it special. You had been up since 6 a.m. preparing for the big day and all the family. You wanted to be appreciated and for it to go well. So, next time let¹s plan a bit of a revolutionary counter attack shall we? Always let Darth hold court. But just once and for about 5 minutes. There is nothing better for a dark lord¹s ego than to start procedings with heavy breathing over how good things used to be. Allow the speech . Acknowledge the wonders. Then after a reasonable listening period say that you have stuff to do in the kitchen and head to the mother star. Never ever let Darth into the galley. This is the operational HQ and no distractions are needed. You can supply Darth with plenty of nibbles and glasses of cheer by getting the little Droids (children or partner) to supply the dark one. Minimal contact at the pre lunch launch is essential. Be Princess Leah. Look a million dollars with make up and the hot outfit ­ but not while still cooking unless you have the fat splash protection force field in place. You will feel better. Do ensure that all Christmas buns are in the oven rather than in your hair. For goodness sake do not stress that Darth had already opened his presents before the rest of the family. The new gloves never fit anyway. It¹s normal. Finally, after the R2D2 and C3PO madness relax into some HDTV. Establish a clear policy first thing in the morning. Whatever Darth thinks, make clear what programme you will be watching and at what time. People will be impressed by your powers. Hope that helps. May the “Firs” be with you! Dr Keith Amoss is a British ex-pat career coach and mentor based in Luxembourg.